Another Great Update: Improved Email Formatting! This is the new email format your clients will see when you send them music! We'll keep this update nice and short but we thought it was worth sharing: We just launched the new email design and layout this morning. 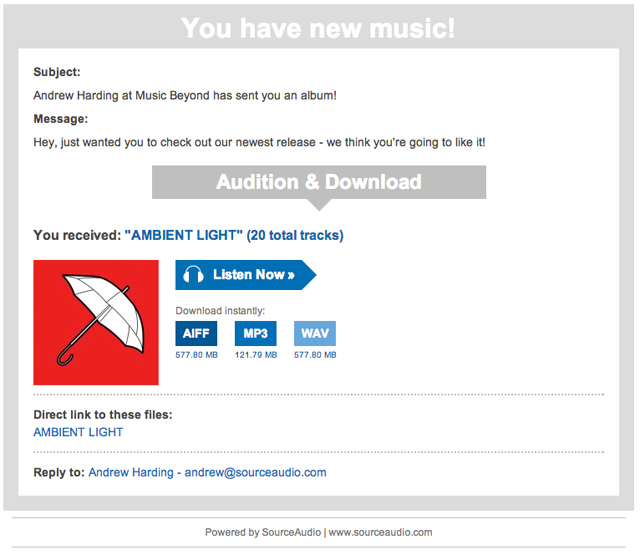 All emails sent through your SourceAudio site will appear in your clients' email bodies just like the image above. It's a much cleaner layout PLUS we've embedded the album art when tracks and albums are sent, and playlist art when sending a playlist*. You still have the opportunity to add your own custom message to each outgoing email so nothing there has changed. For those of you with custom email formatting turned on (you know who you are), you'll want to disable your custom formatting to take advantage of this new, clean, much improved email format. Enjoy and send away! Custom email format tool path: Dashboard > Email Format (turn the custom format switch to "off" at the top to use this new layout!). •One small note about images in emails: Web-based email clients (Gmail, Yahoo, MSN etc.) often strip images out of emails and there's not much that can be done about it. To reveal the album/playlist art you can click "display images" when you open the email. Email applications like Outlook, Apple Mail etc. should display the images nicely by default. « Welcome to the SourceAudio Music Licensing Buyer Network!